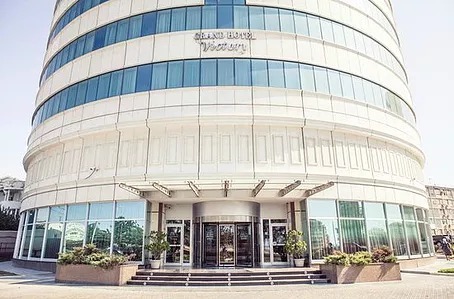 Grand Hotel Victory is rightfully named the most respectable hotel of Kazakhstan Caspian pearl – Aktau. Hotel, which opened its doors in 2007, became the etalon of service and traditional Kazakh hospitality. Hotel is situated in one of the most spectacular points of the city, near the central sea front and city administration center. Atthehotelguestsdisposalthereare 90 comfortablerooms, fittedwithelegantfurnitureandlatest technical devices. Allhotelroomsaredesigned for 1 to 3 guests. Non-smoking rooms are situated on 3rd and 7th floors of the hotel. All hotel rooms are equipped with electronic door locks and modern fire-extinguishing equipment. 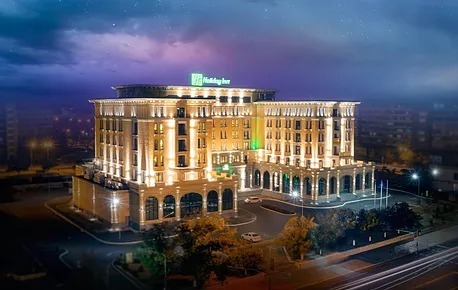 Convenient hotel in central Aktau, with free WiFi, a gym and excellent business facilities Holiday Inn Aktau hotel is 30 minutes from Aktau International Airport (SCO) and less than 1 km from the Caspian Sea. The hotel is located in the city centre and near many major businesses, such as Maersk Oil Kazakhstan. There are 4 bus stops, restaurants, bars, parks and shopping centres within a 10-minute walk. The nearest train station is Mangystau, 20 km away. You can wander along the rocky shore and sandy beaches that line the Caspian Sea or head out of the city into the Mangystau region, where you can explore the breathtaking deserts and canyons.